Do you decorate your home for Easter? 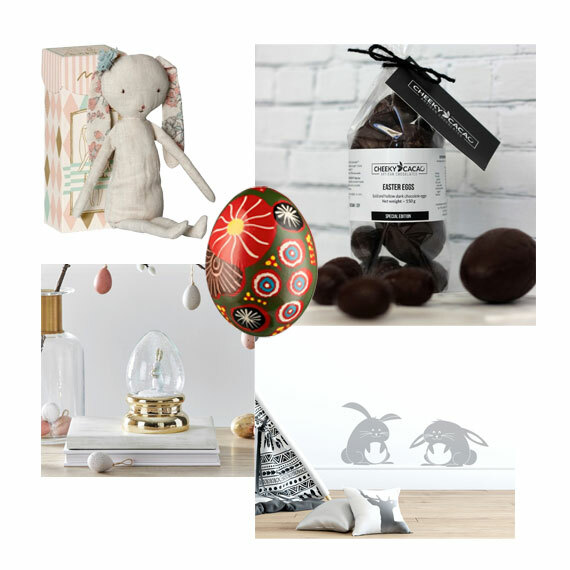 Our top picks for Easter decorating! Decorating our homes for Easter is a pretty new ‘thing’ here in Australia, but it’s definitely a styling period that we are in love with! All of Oxfam’s profits go to helping communities worldwide and the products that Oxfam sell are ethically sourced and produced as well. We particularly love the Painted Wooden Eggs in Oxfam’s Easter collection – each design has a story behind it. These would make such a lovely gift for all ages, but especially for children they would learn about other cultures and families at the same time! Ok, hands up who else has an ongoing crush on Pottery Barn! Pottery Barn have everything you need to set a beautiful table for Easter lunch. We reckon their Easter tableware is so beautiful that it would be such a shame to only use it once a year! At the moment you can save a beautiful 20% off all of the Pottery Barn Easter range and if you sign up to their newsletter you might be lucky enough to save a little bit more before Easter too! Do you prefer to give a gift at Easter instead of chocolate? Nordic Fusion has the most beautiful range of bunny dolls that can be dressed up or cuddled just as they are. They make the most adorable gifts, and not just for Easter! One of our favourite stores for bedding and napery is Bed Bath ‘N’ Table, and oh my gosh … they have over 300 pieces in their Easter range! You’ll be absolutely certain to find at least 5 pieces here that you must have! And even better than just finding beautiful decorating items at great prices, if you’re quick you’ll catch save an extra 25%! If you’ve got people with allergies or other dietary preferences it can be really hard to find Easter Eggs for them! We’ve discovered The Cheeky Project Perth makes the most delicious chocolate including those really hard to find Easter Eggs! Even their images and descriptions will have your mouth watering! Have you been inspired to decorate your home for Easter? We’d love you to share how and where you’ve used your Vinyl Designs decals and any of our blog picks with us – share on Instagram or Facebook using the hashtag #vinyldesignaustralia or tag us @vinyldesign. Follow us on Facebook or Instagram for more tips and ideas on how to dress up your world with Vinyl Designs! Décor that’s purrrfect for every cat lover … we’re not kitten you! Cat-themed homewares and styling accessories that cat lovers will love. We loooove cats here at Vinyl Living and Vinyl Design! Cats bring joy and charm us … even when they’re being obnoxious. Cats aren’t just pets … they are also good for us! A cat’s purring sound is a precious feeling that can put us into such a relaxed and peaceful state. Research has found that cat owners are more socially sensitive, trusting, and like other people more … cats help us to be likeable (as if you weren’t likeable enough already!)! Our cat makeup bag is as practical as it is good-looking! Don’t let the word ‘makeup’ confuse you … it’s just as practical as a pencil case, to hold bits and pieces in your handbag, or even as a carry pouch (phone, keys, cash) when your out and about but don’t need a big bulky bag. Our ‘cat with yarn’ design is available printed on a handy canvas tote or a cushion cover … if you’re a knitter (or know one) this is a lovely gift! We use top quality cotton canvas and all of our printing and stitching is done right here in Australia. 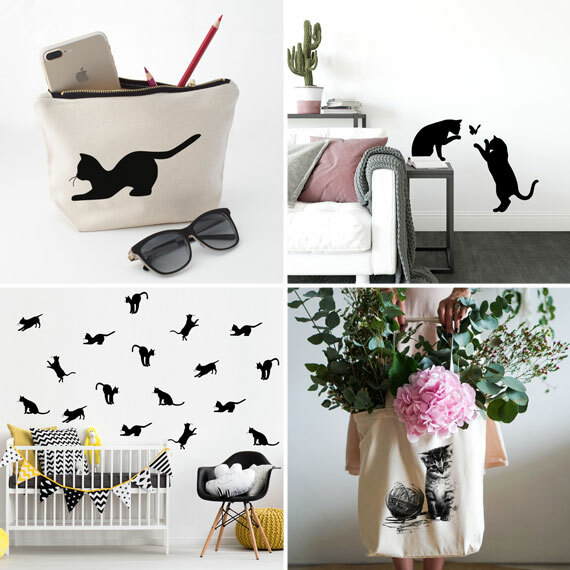 Cats Pattern – scatter these playful kittens across your wall! Le Chat Noir – two real sized cats and a butterfly … look pretty quirky ‘playing’ on a couch or shelf! This cat sticker for powerpoints and sockets is one of our most popular wall decals – a touch of unexpected whimsy! The outside casing of our laptops are pretty boring … show the world your love of cats by decorating your laptop with our Cat Laptop Decals (available in black or white)! Remember nearly all of our wall decals can be made in your choice from our range of colours … go fancy with metallic gold or silver, magenta, or even green cats across your wall! Our vinyl wall decals are removable and won’t damage your walls or other surfaces. Are you a travel lover, do you feel the lust for travel? Are you a traveller? Have you travelled the world? Or, are you just getting started on your dreams of where you would love to go first? In the Vinyl Designs collection you’ll find our super popular World Map with Animals wall decal. The perfect addition to any child’s playroom! Use the different animals that are included in the World Map with Animals set to educate … where does each animal come from? Again in a child’s room … use the map and sticky dots (not included) to mark off countries visited ad countries they’d like to visit. The animals would look fantastic on the wall near the map as an extra decoration. Our World Map with Animals looks amazing, builds imagination, and inspires travelling dreams! Use the animals to decorate your child’s room (they’d look awesome on a bathroom wall! ), and use the world map in your family room or personal space … sort of like a travel vision board! A French Bulldog stole my heart! Decorate your home and yourself with an adorable ‘frenchie’! Bondi Vet says that the French Bulldog is often described as a “clown in the cloak of a philosopher” because of their mischievous attitude hidden behind their sometimes stern face. We reckon that pretty much sums them up! With great personalities and loving natures they make wonderful family pets … so it’s really no wonder that we also love to decorate with their likeness! With our French Bulldog wall decal you’ll feel your heart strings tugging madly as she watches you with ‘those puppy dog eyes’ … and you can have our adorable Frenchie on your wall in any one of our range of 25 colours. The almost perfect solution if you’re not allowed to have a dog ;-) The same adorable Frenchie can go everywhere with you (well, wherever your laptop goes) coz we also make her as a laptop decal! 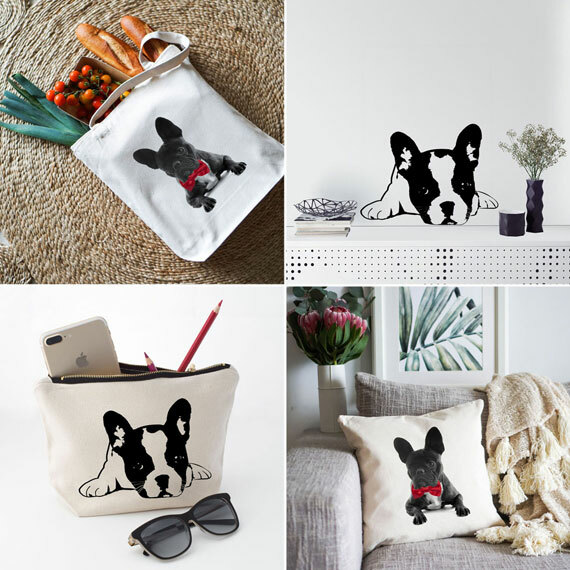 Our hand printed canvas range features the most handsome and noble French Bulldog on either our canvas tote bags, or our canvas cushions. Love this guy in his dashing bright red bowtie! Give your home a tropical beach vibe wherever you live ! 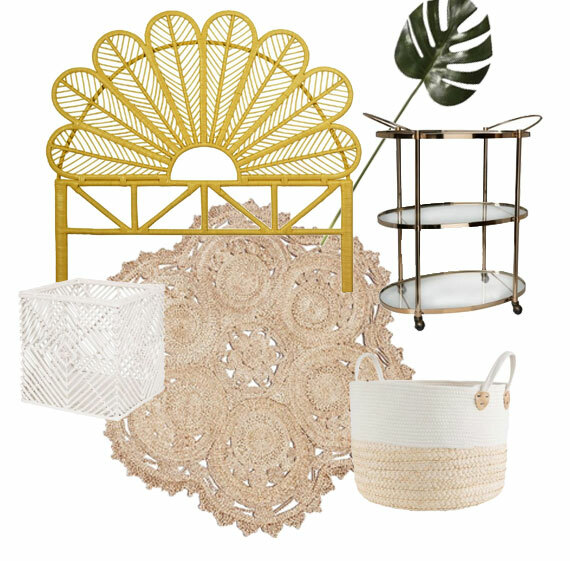 Rattan furniture, leaves prints, jute rugs and everything else for the perfect beach house! We all love the relaxing feel that we get during a summer break, and who doesn’t dream of kicking back in a tropical paradise without a care in the world?! We sure do! The trouble with the tropical paradise dream is that it’s not always possible to get there … and if you do get there It doesn’t come back home with you. That is … until you decorate your home with that relaxing, soothing, refreshing tropical vibe! We’ve done some online browsing and have made a list of some of our favourite decorator items to make it easy for you to give your home a tropical beach vibe … wherever you live. Rattan furniture is making a comeback and is gaining in popularity as we speak! Did you know that rattan furniture not only looks GREAT but it is also environmentally friendly too? Rattan grows all year ‘round and the planting and harvesting of the growth assists in restoring the decrease in the population of trees and forests … and it’s a fantastic alternative to logging too. Melbourne-based The Family Love Tree hand craft beautiful rattan furniture and homewares using traditional methods and supporting small villages and communities along the way. We love the whole range of The Family Love Tree’s rattan pieces, but the Latitude range has really grabbed our fancy! The Latitude range is described as “elegant, understated design meets lush, tropical sensibilities” and we couldn’t agree more! From bedheads, to planter boxes, to bar stools this range screams “TROPICAL” to us, don’t you agree? Freedom Furniture has a range of tropical inspired homewares too – affordable and look amazing! Our top picks from Freedom Furniture this month are: Monsteria Leaves in two sizes (look real and you don’t have to water them! ), the very glam Ritz 3-tier drinks trolley (makes us think of a posh tropical hotel! ), and the very stylish and of so practical Araby Basket and the Landoni Basket. Splashes of colour and eclectic design to create your very own individual space! You know how sometimes you come across one divine designer piece through your newsfeed or Instagram feed, or even in a proper magazine … a piece that you instantly fall in lust with?!? One thing leads to another and you find yourself tracking that one solitary piece of divineness to the website where you can purchase it … and then you DISCOVER a whole lot more divine pieces that you fall utterly head over heels for? We do! For us it all started when we caught sight of this gorgeous print by Brent Rosenberg. Titled ‘Beautiful Morning - White’ it is part of his amazing ‘Beyond the Noise’ collection. Printed on 300gsm bright white cotton rag paper with archival prints; this is a limited edition with a print run of only 50 and each one signed by the artist. Where did we discover this gorgeous print and what else did we find there? Co.Co the shop can be found in Bay Street Port Melbourne, and of course they are also online for those of us not lucky enough to be able to shop in person! Co.Co describes themselves as “a colourful collection of people and personalities with a consuming passion for beautiful design” … we reckon that a perfect description for the amazing collection of eclectic and beautiful pieces we’ve discovered in their online store! Mongolian Lambswool Clay Cushions: Oh my gosh, they are soooo soft! What a beautiful focal point one of these would make to your lounge chair, or a sumptuous addition to a special chair in the reading corner! Lynette Velvet Musk Cushion: The Mongolian lambswool cushion is gorgeous but why not go the extra mile in lush and add one of these stunning cotton velvet cushions too?! Mixing textures is a wonderful way to add luxe style! Margot 3-seater Velvet Sofa: This, now THIS, sofa was designed so be sat on … and enjoyed! Covered in the most sumptuous soft velvet, or in a stunning fabric, you will fall in love with this sofa like no other! As if it wouldn’t be difficult enough choosing just one colour/fabric (there are five to choose from) you’ll also need to choose from either brass or black legs … our vote goes for the brass! 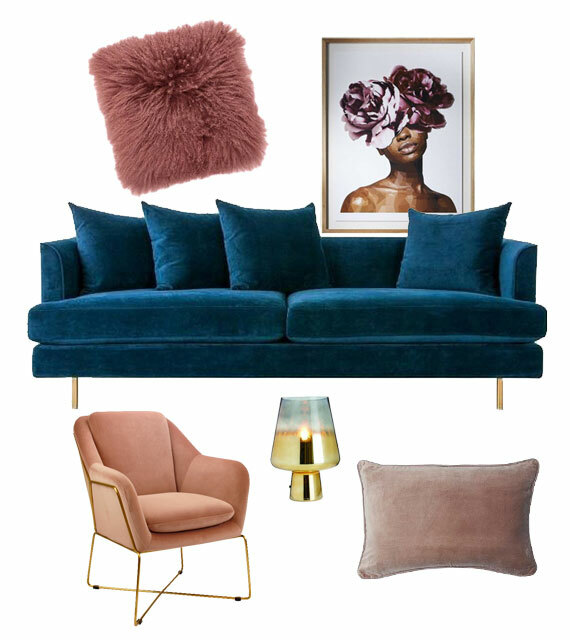 Milan Chair – Blush: If you’ve got a sofa you’ll need an armchair as well ;-) The Milan chair with it’s brass legs and velvet upholstery is the perfect companion to that gorgeous Milan sofa! Nel Lusso Mushroom Lamp in Gold: One word describes this … D-I-V-I-N-E. Oh wow, you will love this lamp … the ambient glow it gives is truly swoon-worthy! We’d love you to share how and where you’ve used your Vinyl Designs decals with us – share on Instagram or Facebook using the hashtag #vinyldesignaustralia or tag us @vinyldesign. Follow us on Facebook or Instagram for more tips and ideas on how to dress up your world with Vinyl Designs! Bring some outdoors in, as we prepare to wave goodbye to winter! 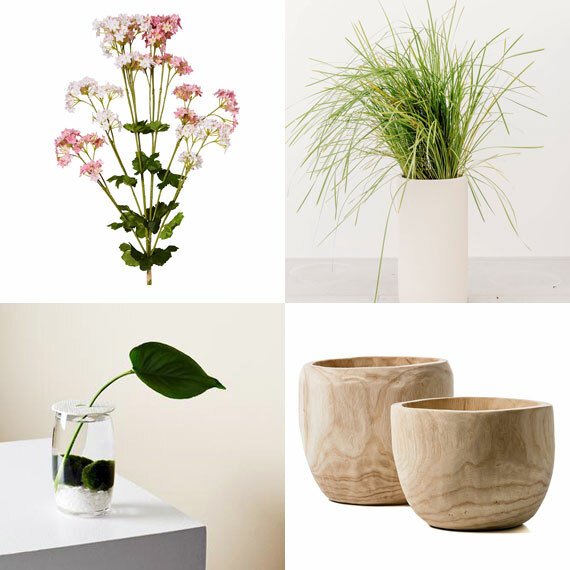 We’re craving greenery and have discovered some beautiful pots, other botanical inspired delights. Indoor plants are SO good for us … they are scientifically proven to improve our moods, improve air quality, help us sleep or study better (not at the same time!) … and, they look great too! But, it’s not just a matter of picking any ol’ plant and bringing it indoors ;-) It’s important to select the right plant for your home and treat them right so they will groooow and thrive! You could aim for a plant in every room, and then maybe bring in a few more to particular areas for the added benefits plants will bring as well as for impact and to brighten a space that could do with a little more interest. If you are lucky enough to have a wide window ledge in your kitchen, hall, or laundry you could dedicate the space to an indoor garden – if you aren’t lucky enough to have the ledge you could ‘fake’ one by using a couple of shelve brackets right under the bottom of the lower architrave of a mid-height window, add a shelf and then pretty up with your plants! These gorgeous Jasper Timber Pots by Home Republic are available from Adairs and would look AMAZING in a large collection! For a small hall table or corner space how striking would these Cylinder Pots from Pop and Scott look?!? You could pot them with plants of varying heights and foliage, use them to display foliage from outdoor plants, or even fill them with faux blooms from Adairs beautiful selection (seriously, they look real!). Do you remember how exciting it was as a child to pop a stem in a glass of water and watch it slowly grow roots? Well, Ivy Muse have these beautiful ‘Stem’ vases that are ideal for propagating plants (like the popular designers choices Devil’s Ivy or Monstera) – made from clear glass with a pretty 3-D printed ceramic top by the Alterfact Studio in Brunswick these vases are absolutely divine! Time for a kitchen décor spruce up! Whether you love to cook or you’re ‘meh’ about cooking the kitchen is the heart of every home! We tend to spend so much time in our kitchen … whether it’s cooking, eating, or cleaning up … that we don’t often get the chance to give our kitchen décor a bit of a spruce up. 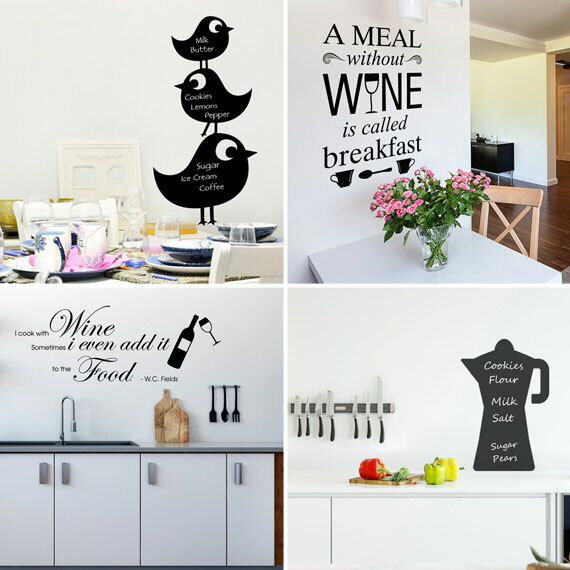 Vinyl Design has a great range of wall decals that would look amazing in any kitchen! Got patterned wallpaper instead of painted walls? No problem … because Vinyl Designs wall decals can be used on windows and doors as well! Use our chalkboard decals to help your family remember what they’re meant to be doing … or what you need to buy. Add a touch of whimsy to your kitchen with our trio of birds chalkboard, a quirky moka chalkboard, or these fun speech bubble chalkboards. All of our chalkboard wall decals are the perfect size for writing your notes … and we’ll even send you the chalk! Inside the pantry (although these are so nice they’d look fantastic out on the benchtop!) our chalkboard labels are perfect for labelling your pantry staples – each pack has six labels and you can choose from six different designs for your chalkboard label pack. The kitchen shelves wall decal is super fun and can really jazz up a kitchen that doesn’t have a lot of fitted wall cupboards or shelves. Being wipe clean you can also position them above your cooktop, which is a real bonus. Each set comes in your choice of two colours – go bold, go retro, or go glam, the choice is yours! These kitchen shelves decals are supplied with each piece ready for you to attach individually so you can make up your own composition … now that’s going to be fun! No kitchen is complete without tea towels! Over at our sister site Vinyl Living we have absolutely gorgeous 100% linen Australian made and designed tea towels in eight original designs … our tea towels make the drying up a breeze (and even fun!). Order individually or choose any two tea towels for the special package price of just $40. Our “A meal without wine is called breakfast” quote wall decal would suit just about any breakfast bar! And in a choice of 25 colours you are sure to find a colour to suit your kitchen colour scheme. Maybe you’ve got a specific design in mind for a custom reusable wall decal? We love doing custom wall decals, so if this is something you’d like to discuss please get in touch with us and together we can make it work! What’s your family’s special quote? Does your family have a special saying, or is there a special quote that you love? Maybe you’ve always wanted to dress up a wall in your home but don’t know quite where to start? We love doing custom work and when we think about all the custom quotes we’ve created over the years for our lovely customers there are two that really stand out … both of them looked amazing and the love for them keeps coming and coming! How beautiful is this girl's room created by Justine Brown of Chocolate Brown Interior Styling! It’s the perfect bedroom decal to inspire both little people and big people who are thinkers, doers, and dreamers. Justine chose to have this decal created in our silver colourway … what would your colour choice be for your room? Ps. We love the wooden swing Justine used in this room too! Our super happy customer Jessica had a wall that needed some dressing and what a beautiful way she chose to dress it! This family and friends daily reminder of living a happy and caring life has really taken on its own place in Jessica’s home and looks amazing! 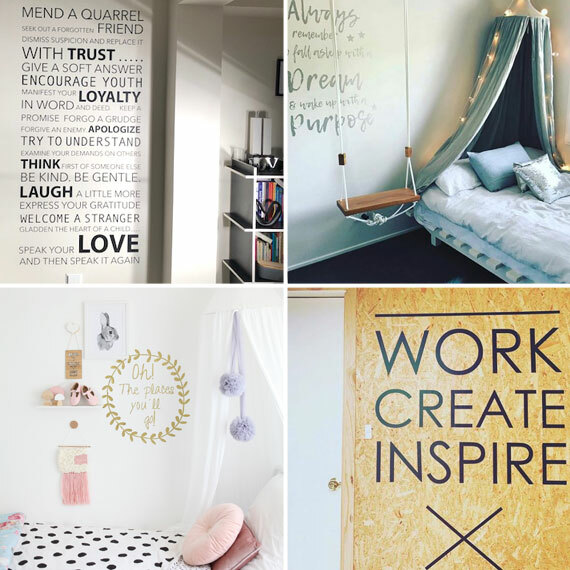 Can you imagine something like these on your walls … remember our decals come in 25 different colours and are removable so even if you’re renting or don’t want to mark your walls you can decorate your home with a special quote too! 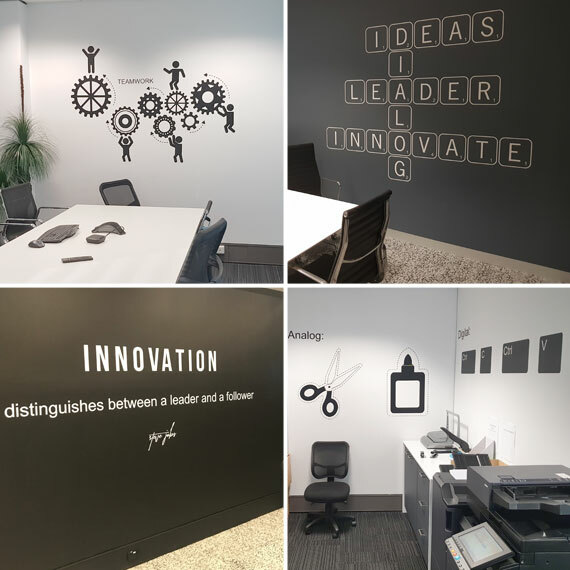 Recently Vinyl Design were engaged to create custom wall decals for three businesses – Dialog in Melbourne and Steric and Xinja in Sydney. Steric has been around since 1964 and are sure to have processed and packaged lots of foods that we’re all familiar with. Dialog has grown since their inception in 1979 to provide innovative IT solutions across Australia to all industry sectors. Two different office décor looks for very different industries … IT and food! It’s important for our workspaces to be harmonious, unfussy, and uncluttered to allow for creativity and industriousness to flow. But at the very same time it’s important to avoid a sterile and stark environment … it can be a tricky design game! Neutral walls are a very good place to start because that gives you a base to decorate with wall art as well as important company information. We worked with Steric to create teamwork and meeting spaces that will ensure that the company’s vision and purpose are forefront in planning and development. A constant reminder of what Steric is all about. We used both images and text to ensure that the large wall piece was a focal point of the meeting room, is visually appealing, and it’s message is clear … but also leads to creativity in thinking and discussion. This large custom wall décor for Steric sure is a winner! Dialog are innovators in the IT space and so it makes perfect sense that the custom office décor we worked with them to create reflects that. Areas of the office building that would usually be left plain, boring, and lacking in creativity now have the designer look (and well within a design budget). The printer room has a fun new look – not necessary; but an injection of fun to an otherwise boring and monotonous task area making collecting and setting up the print run something more fun!